The Apogee Duet is the newest ultra-portable USB audio and MIDI interface from Apogee. It features two analogue inputs and four analogue outputs on a breakout cable, as well as the legendary Apogee AD/DA conversion, OLED display metering, a mutlifunctioning control knob and 24bit/96kHz audio quality. DAC designed for iOS devices, the Apogee Duet is a compressed USB audio and MIDI interface. 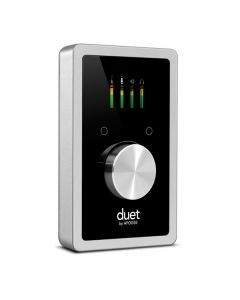 Any lesser home studio or road musician’s arsenal is immediately improved by the Apogee Duet thanks to the now near-mythical Apogee AD/DA conversion, two analogue inputs, four analogue outputs and a wide range of connectivity choices. Monitoring of pre-fade mixes when DJing or click tracks when recording is enabled by an autonomously controlled ¼” stereo jack headphone output. A USB MIDI connection for manipulation of synth, keyboard or DJ controller provides the Apogee Duet with MIDI connectivity. The Apogee Maestro app on iPhone or iPad means you can exercise software control of various hardware parameters using the Duet. This audio interface comprises some truly astounding power, given its incredible weight and ultra-portability. The on-board ESS Sabre 32-bit Hyperstreem DAC chip with Time Domain Jitter Eliminator bears the burden of digital to analogue conversion. Clock inconsistencies from incoming digital signals are extricated in this manner - the subsequent analogue output upholds the quality of the original signal. High quality audio with low distortion and an increased dynamic range are also delivered by this technology. A breakout cable enables improved connectivity and lends the Duet its compact nature. Two combination XLR/jack connectors for external microphone and instrument inputs and two ¼” balanced jacks for dual stereo outputs are included in this cable. A high resolution OLED display for input/output meters, a multifunction controller knob for function select and input/output level control, two assignable touchpads, an input for breakout cable and a USB connection for Mac USB, iOS Lightning and iOS 30-pin cables are the Apogee Duet’s other key features. Portable USB audio and MIDI interface for iPad, iPhone and Mac. Works with Maestro app for iOS and Mac, as well as other music apps like Garageband. iOS 7 & OS X Mavericks compatible. Works with OS X 10.9 Mavericks. Works with iOS 7 on iPad, iPhone, iPod touch. Charges iOS devices while on mains power. Designed in California - Made in the U.S.A.